Bette Midler to Star in Broadway's Hello, Dolly! Four-time Tony Award winner Jerry Zaks will direct, and Tony winner Warren Carlyle will choreograph the production, which will begin Broadway previews March 13, 2017, and open April 20 at a theatre to be announced. Midler issued a statement saying, "I am looking forward to portraying one of the most beloved characters in all of American Musical Comedy, Dolly Levi, born Gallagher, in Hello, Dolly! I know I'm going to have the time of my life, and I am so glad to be under the wings of Scott Rudin as Producer and Jerry Zaks as Director. See you next year!" 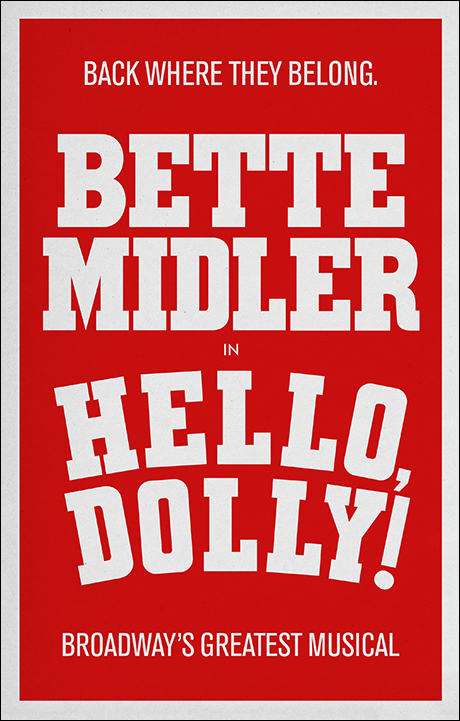 Composer/lyricist Jerry Herman said, "Many times through the years I've been asked about bringing back Hello, Dolly! – and it has always been, 'Who would be my dream Dolly?' – and though I've had literally dozens of names tossed at me, I knew that we needed more than just a wonderful singer or a wonderful actor, so I held on to the hope that she would also be a distinctly original persona. Who is out there that has the necessary stature, warmth, the incredible talent and ability, and especially the singular, outsized personality that I was looking for in a 21st century Dolly? Only one person: Bette Midler. Only Bette could bring Dolly brilliantly back to 'the lights of 14th Street!'" No other casting was announced. Tickets won't go on sale until a theatre is announced. The title role, one of the greatest leading lady roles in musical theatre, was written for Ethel Merman, but ultimately originated by Carol Channing, who won the Tony Award as Best Actress in a Musical for the role, and also starred in the most recent Broadway revival of the musical in 1995. During its original run the role was played by Ginger Rogers, Martha Raye, Betty Grable, Phyllis Diller, Bibi Osterwald, Thelma Carpenter, Pearl Bailey and, at last, Merman. Barbra Streisand starred in the film version. Produced by Scott Rudin, the show has a book by Michael Stewart, based on The Matchmaker by Thornton Wilder. It won a then-record 10 Tony Awards in 1964, including Best Musical, and ran 2,844 performances, making it briefly the longest-running musical in Broadway history. Midler tweeted the evening of Jan. 18 a teaser about "an announcement coming tomorrow"—with a broad hint about what that project might be. Well HELLO! This Dolly has an announcement coming tomorrow ! Stay tuned! Yes, I am taking on the role of the beloved Dolly Levi in "Hello, Dolly!". We open next year on Broadway! So excited! Singer/actress Midler, who made her Broadway debut partway through the original run of Fiddler on the Roof, returned with concert shows in 1973 and 1975, and made a recent encore as a performer in I'll Eat You Last: A Chat With Sue Mengers in 2013, and as a producer of Priscilla, Queen of the Desert in 2011.